I'm behind. So weird I know. So I figured I'd do a Denver Bronco mani for the Bengals game. It was one that made me sweat for sure! 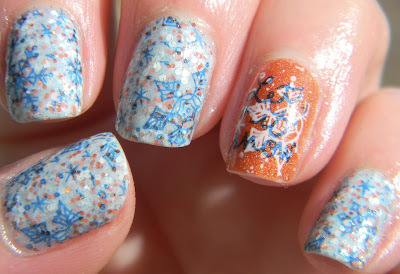 Orly Milky Way was the ideal base for this with it's blue and orange glitter. After two coats, I stamped with CBL Bronco Blue and snowflakes from Bunny Nails HE-F plate. Accent nail is two coats of Avon Saturn stamped with Sinful Snow Me White from the same plate then Bronco Blue. It did the trick and we made it to the playoffs! Love these! 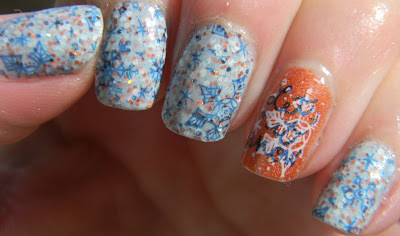 The colors look so great and the stamping is perfect. 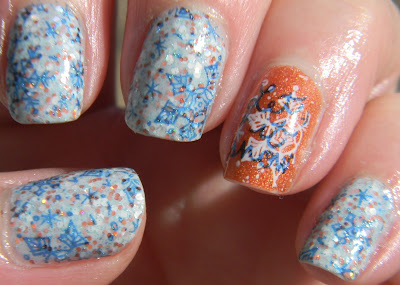 Layering the "Let it snow" over the snowflake is a really nice touch on the accent nails! Go Broncos! (That's my sister's favorite team and I brought her a Bronco's shirt when I visited Colorado last year). Woot woot! That's my girl then. Its pretty! The blue and orange look great together.